I have installed a wireless flow meter as part of a new install of an irrigation system. 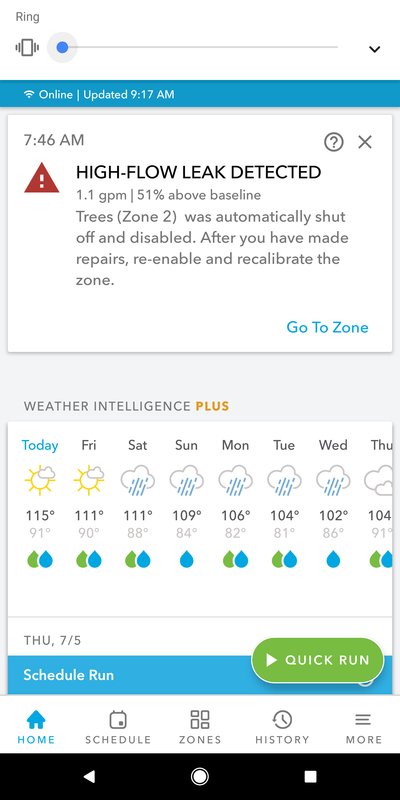 I received high flow/leak alerts for the zone that contained drip lines. I was unable to identify any leakage in the zone, so I re-calibrated and it appears to be working OK.
Is it normal for a new drip line installation to vary by over 10% flow in the first week of installation. That kind of variance seems probable as the system beds in, but wanted to get folks’ opinion. I do think the default of 10% is too low for drip. Here’s how I initially picked a threshold. I haven’t had any false triggers, but believe it or not I caught a real leak! I think a rabbit or some other animal chewed threw the line. I might drop that 145% down a little bit at a time to see when I start getting false triggers, but for now I’m happy with the way it works! Do you believe that the 10% variance is appropriate for sprays? @ukinne You might also want to try re-calibrating with a higher pressurize time which might help dial things in better. For my grass I’m set to 110% and that seems to be working fine. As @franz mentioned, using a higher pressurization time might help as well. I have mine set to 10 minutes, which is probably much higher than it needs to be. However, just from walking around the yard when I turn on the drip I know it takes a while for my drip flow to stabilize.